First of all, and probably the key item of this collection, are the Essence Juice It Jelly Nail Polishes. There are a total of four colors of these semi-transparent jelly nail polishes available and I received 3 of them called Jelly Orange, Jelly Water Melon and Jelly Cherry. 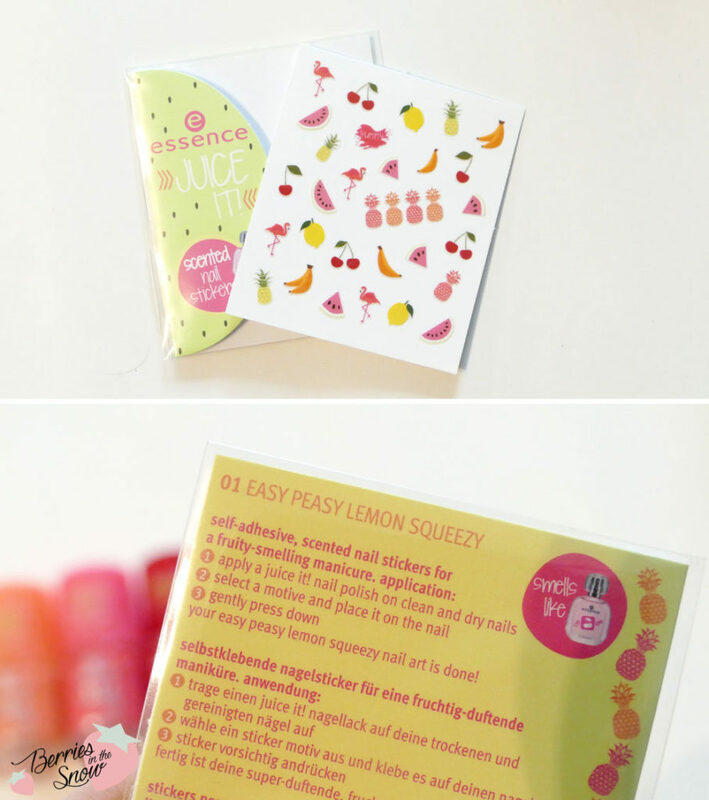 Additionally there are some Essence Juice It Scented Nail Stickers which you can use to spice up your nail art. The nail polishes have a short application brush, which made it a bit difficult for me to paint my nails. With one layer the colors are not opaque and you will see the white of your nails through the polish. Two layers, or even three layers are really pretty nice and give a nice jelly effect, aswell. The glossy jelly finish also stays for a long time and is not disappearing after 1 or two days, but the surface of the dried nail polish is prone to fine scratches. the staying power of the nail polish was nice though, depending on how much work you do with your hands of course. The scented nail stickers have a nice fruity scent and there are quite some different motives on the sticker sheet, reaching from fruits to flamingos. You just have to press them onto your nails and you are done. I didn’t use the stickers yet, but I think I will definitely go for it during the upcoming summer weather. The item I wanted to buy anyways from this collection was the Essence Juice It Detangle Brush! I fell in love with the watermelon inspired design at first sight. 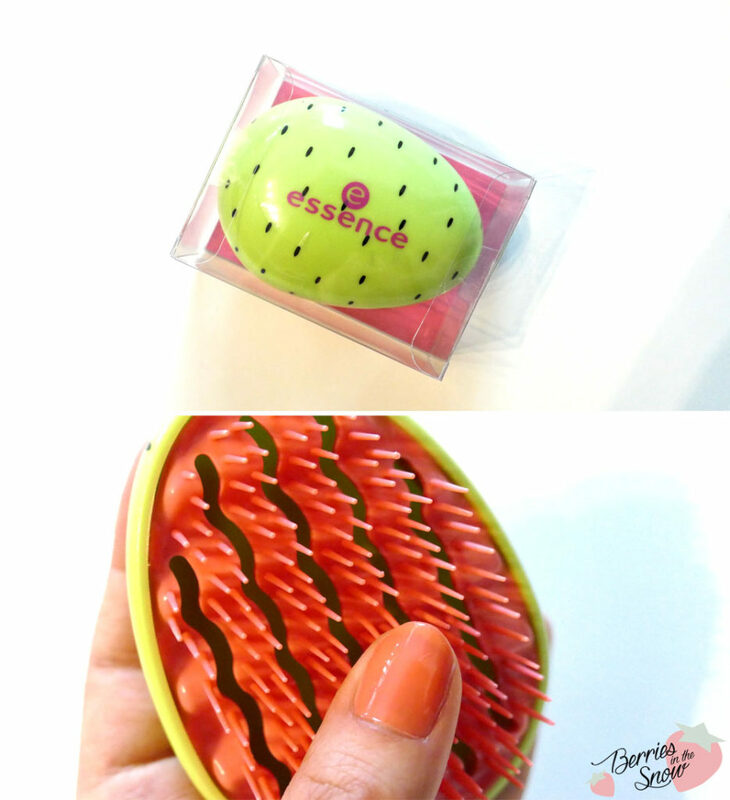 The brush is similar to a tangle teezer, but smaller. The brushes feel a bit stiffer than the ones of the Tangle Teezer, but still it is so cute and has the perfect size for carrying it around! My favorite item from this collection! 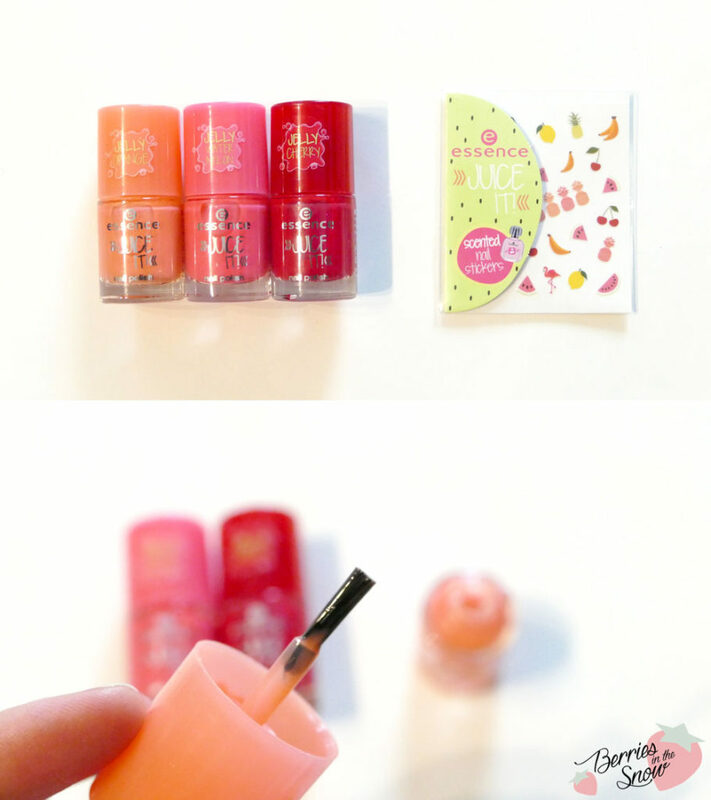 A makeup line without any lip products is not a real makeup line :D So here are two lip products from this collection, the Essene Juice It Jelly Tint Lipstick and the Essence Juice It Glossy Lipliner. 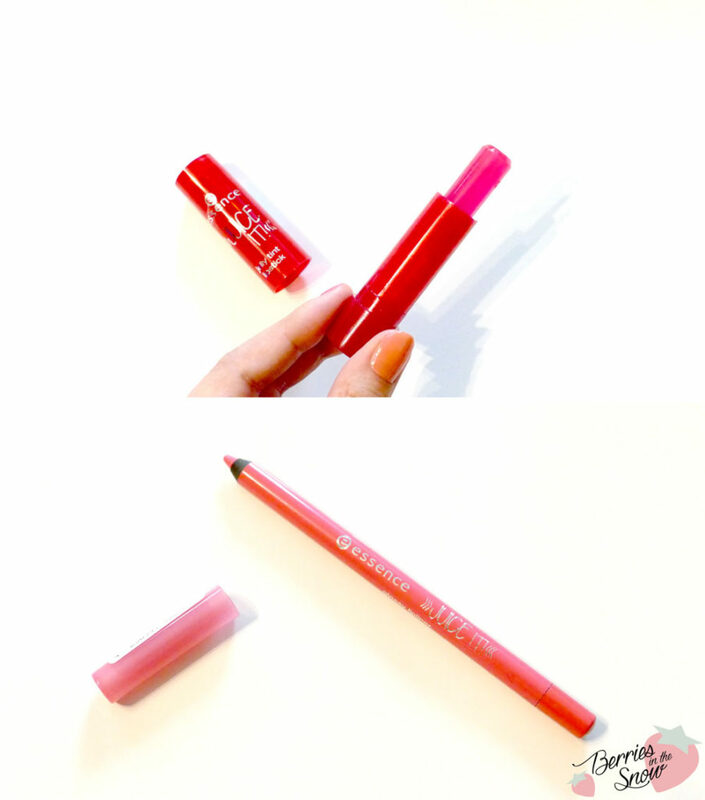 The Jelly Tint Lipstick in shade “01 Cherry Cherry Lady” reminds me of the Holika Holika Aqua Petit Jelly Tint. It doesn’t show any tint though on my skin, but seems it has a very subtle pink stain. It is not visible on my lips and has more a feeling of a balm than a tint or lipstick. The Glossy Lipliner in shade “02 You Are One In A Melon” has a light pink color and a creamy texture. It spreads nicely across the skin, but unfortunately is barely visible on my lips, too. 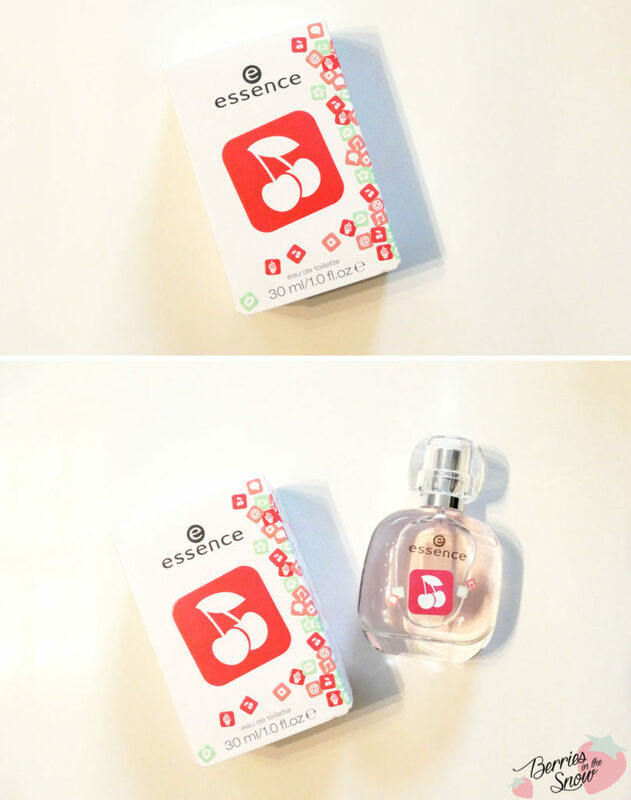 The last product I want to share with you from this edition is the Essence Juice It Cherry Eau De Toilette. This light perfume has a nice fruity scent and luckily does not have any overpowering artificial cherry scent. It will be liked by people who love fruity perfumes. Unfortunately, it doesn’t last too long and fades too quickly. 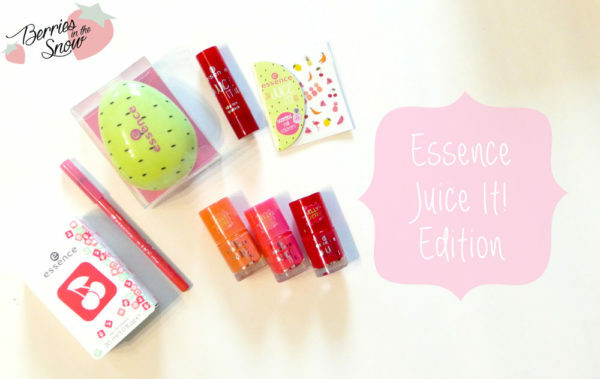 All in all the theme of the Essence Juice It Edition fits perfectly to the summer season and the colors are nicely selected and make me crave for fresh and colorful fruits. I really like the Jelly Nail Polishes and the Detangle Brush and also the scented Nail Stickers are such an adorable idea. Since Essence is a drugstore brand the products will be available at an affordable price, too, so if you like any of the items it is worth to grab them as long as they are still available. 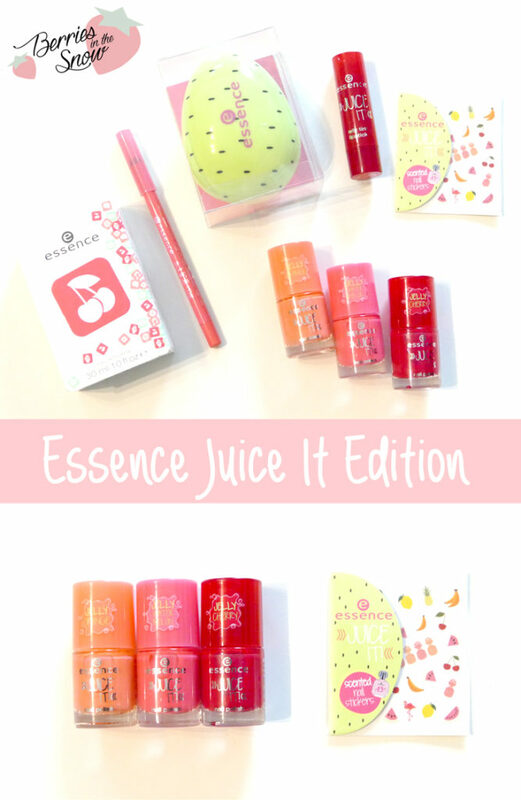 What is your impression of the Essence Juice It Edition? Just as a short reminder: All products mentioned and reviewed on this blog are of my personal opinions. This product here was sent to me for reviewing purpose by http://www.essence.eu/ which doesn’t influence me in providing my honest opinion on the products. Sehe ich genauso…War schon bei der Cinderella Kollektion üverrascht aber die finde ich auch super gut! Liebe das Design von der Bürste.